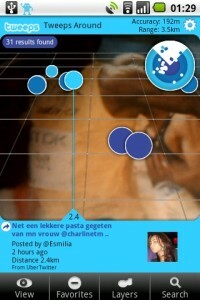 Using Tweeps Around a lot in Layar? Want to have a nice clean app icon or shortcut to place on your Android’s home screen? 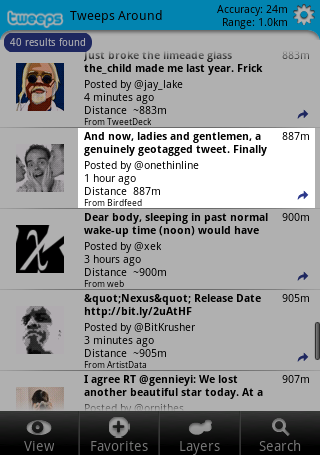 Now you can: today the TweepsAround launch app has been released in the Android market. 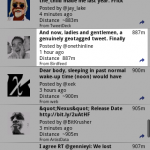 TweepsAround Launcher is a real Android application, so you can place it anywhere on you Android phone. When activated, it opens Layar with the TweepsAround layer in Reality View, no more browsing in the catalog. The app also checks if you have Layar installed. 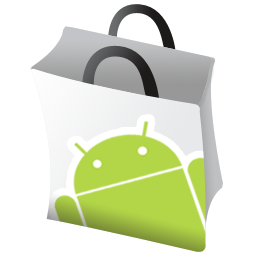 When not, you get a button which takes you directly to Layar in the Android Market where you can download it for free. Want to give it a spin? The QR code below links to the app in the Android store, ready to install. Or you could search for “tweepsaround”. Of course all feedback, hints and tips are welcome! Update: you can find Tweeps Around in Androlib now. Is this based on a generic launcher application that’s publicly available or is this custom? @Jens it is a custom built app; I don’t even know if there are generic launcher apps for Android (there seems to be something along those lines for iPhone I was told). The popular Augmented Reality app Layar just got updated to a very exciting new version with support for a 3D Reality View and a couple of other neat features. Like to experience this yourself? Make sure you have the latest version of Layar installed in your iPhone (free download in App Store) or Android powered device (free download from Android Market). You need a Twitter account with geolocation eneabled to send local tweets yourself (no worries, Tweeps Around will guide you through the process when you first log into Twitter). Right now Twitter released their long awaited Geotagging API and activated the user interface for every user: Think Globally, Tweet Locally! 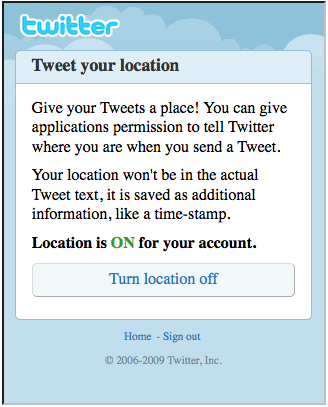 This allows every twitter user who uses a (mobile) device that is capable of determining their location, to annotate their tweets with exact location. This makes Tweeps Around so much more useful! Up to now, the location had to be parsed from the user’s profile location field, which some clients indeed dutifully update with the location of the last posted tweet. But this is often rather inaccurate, as the last update is kept when no location data is available. So, we will get real exact locations and – as can be expected – many more location annotated tweets. That is, if users are willing to activate the geotagging setting and use the feature. It is switched off by default, for privacy reasons, so you have to manually activate it under your twitter account settings (the mobile settings lead to just one activate button). Be sure to check out Tweeps Around the coming days and let’s see how fast this catches on! BTW: in Tweeps Areond, the officially geotagged tweets are indicated with Distance 234m, whereas the guessed locations are prefixed with a tilde character, like this: Distance ~234m. Direct link to Tweeps Around Layer (open from your mobile phone, iPhone or Android). Spotted via Twitter: looking at Shiodome over #layar browser with Tweeps Around in Tokyo. Nice to see this in international context just hours after the launch! 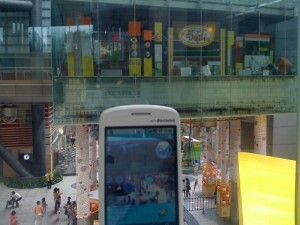 More info about Layar and Tweeps Around in my previous blog post. 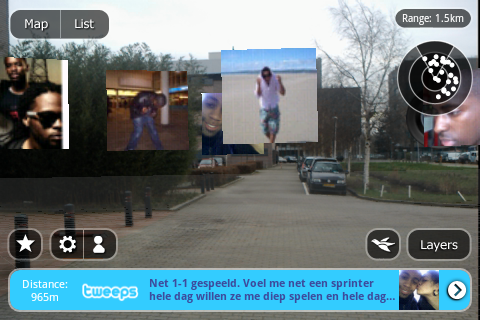 If you’re on a mobile browser and have Layar installed: click here for Tweeps Around in Layar. Earlier today Layar announced the next all new version of their Reality Browser Application for mobile devices (also known as Augmented Reality application). This finally lifts the embargo on my work for this platform: Tweeps Around, which adds an overlay of what people on Twitter are saying, right here and now! Update: I added a short FAQ for Tweeps Around, be sure to check it out for more detailed information. Suppose you have the all new Layar 2.0 app installed on a supported device (Android, iPhone awaiting Apple’s aprovement). You open the application and search layers for tweeps around (or just tweeps). Activate the layer and look around on the phone’s screen. You’ll see circles popping up, each representing a Twitter user (Twitterers also known as a “Tweeps”, hence the name), selecting it gives you all the details of their message and links to relevant references. While the Layar app in itself is already quiet exciting, the most important promise lays in its tiered distribution approach. In fact, the Layar app is indeed a browser which does not contain, nor limit reality content to display. This way, responsibilities are distributed over various parties in the industry. Content owners: make sure the content is marked up with accurate geolocation information. Independent developers (such as me): build a wrapping API to interface between content (e.g. a geo database) and the Layar service. Layar: negotiate distribution deals with platform owners (Apple, Google, …) and Mobile operators (to have Layar pre-installed on devices). I strongly believe in this strategy, where domain knowledge, marketing + distribution and development each are in the hands of the respective experts. Layar allows for a quiet some customization of graphic elements, e.g. company logo and banner on top, custom icons for points of interest (POI’s) and action links to call a phone number, send a text message or go to any conceivable web URL. Here are some opportunities for monetization as well, e.g. by inserting advertisements, call premium phone numbers of have users sign up for additional web services and revenue shares with destination sites. Of course, this is just the beginning. The beginning of Reality Overlays on mobile devices becoming ubiquitous. 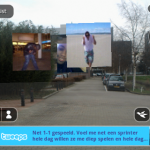 The beginning of Layar as platform for easy access of geo information. Many exciting new applications are around the corner to be discovered and become “best practice” in less than no time. Distribution and localization can be local as well as worldwide (e.g. Twitter is a global phenomenon, while your data may well be focused on a single city or country). Any type of data can be visualized, as long as it is somehow relevant to a specific location. I’m ready to dive into this exciting world with lots and lots ideas waiting to be tested and implemented. The Twitter overlay serves as a test case which was in fact surprisingly easy to implement for the Layar platform. Please let me know when you have geo data waiting to be explored as reality overlay and we will work something out! Note that there is no sign up fee for Layar until the second half of September, 2009. After September 15th a one time sign up fee is required (depending on company turnover). Use one of the barcode scanners from your Android phone to open the Tweeps Around layer in Layar: point your camera to this QR code (image to the right) and select “open in browser”. congrats on your Layar App! Can’t use it since I have no Android phone, but it sure sounds like a useful little app. A little patience… Layar is coming to iPhone as well, currently waiting for Apple to enable the built in camera for video overlays (at least that is how I understood it). I have an android have installed layar and can see other peoples tweets. How can I find out if my tweets are available to another layar user? 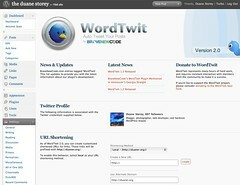 I just discovered and installed a very nice WordPress plugin, WordTwit. The main purpose of this plugin is to tweet your new blog posts on Twitter, together with a link to the new blog post. So far nothing too shocking new, but the latest version (2.0.x) of the plugin adds the option to use your own blog as url shortening and redirecting service. Think tinyurl.com, is.gd or one of the gazillion alternatives out there. Now that is really cool. Except it didn’t work for me. Turns out that there was a little bug if your blog is not served off the root or your domain, but a sub directory instead (which is /blog in my case). So, a patch (shortened link, noticed?) solved this and all should be set to go now.